The Power-Pole – an ingenious remote-controlled shallow-water anchor system seen on the back of many bass and flats boats these days – should come with a caution sticker that reads: Warning, once you use a Power-Pole, you can never go back to not using one! Several years ago I borrowed a friend’s boat equipped with a Power-Pole and when I had to revert back to my own Power-Pole-less boat, I could not function. I felt incomplete and helpless in shallow water without the ability to “power pole down” on command to keep from blowing out redfish schools. My problem with putting a standard Power-Pole on my 14-year-old, 17-foot aluminum boat was the boat had not a shred of room left in it for a hydraulic pump. The bilge area was already crammed with too many extras: an extra battery, a jack plate pump and a large gas tank. Plus, putting a full-size Power-Pole on my already “feature-packed” 17-foot aluminum seemed like overkill. Then Power-Pole introduced the Micro Anchor – a small, compact all-in-one electromechanical unit that simply drives an 8-foot fiberglass “stake-it” anchor pin into the bottom to hold the boat’s position. The unit does this through a sleeve of brilliantly designed rollers that sort of “roll” the stake up and down, applying enough pressure to force it into the ground, holding the craft in place. 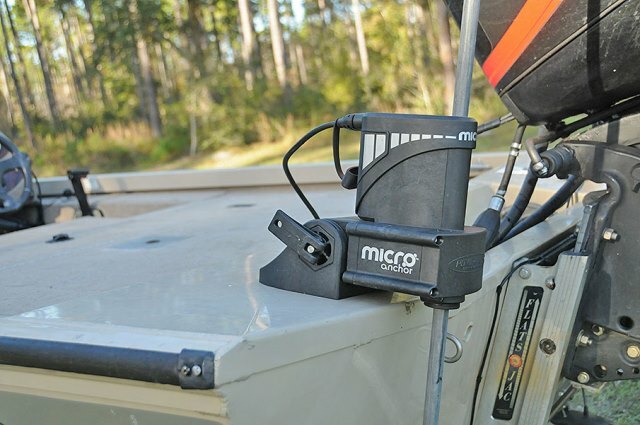 The Micro Anchor was designed for kayaks, flat-bottom jons, Gheenoes and tiny skiffs weighing less than 1500 pounds. I was afraid that putting it on an aluminum boat with a 90-horse engine may have been asking a little much from a Micro Anchor. But I was desperate for boat control. I love my aluminum beater because I can shimmy through mud flats, scale over oyster bars and traverse up rock-lined tidal creeks without worrying about damaging gel coat. So I gambled on the Micro Anchor and I can honestly say it’s been the best addition to my “feature-packed” aluminum since the addition of my hydraulic jack plate. The Micro Anchor is rated for crafts up to 1,500 pounds; I’m guessing the weight of my bass-style aluminum with a 90-horse two-stroke motor, batteries, trolling motor, people, etc., is probably pushing this limit. Initially, I was a little skeptical about the unit’s ability to drive a stake into the ground with enough force to hold my boat. The verdict? The Micro Anchor does a fine job of holding my boat in place. Now, admittedly, I’m a fair-weather angler. “Light and variable” is my green light for flats fishing. Most of the time I’m fishing in good conditions where I simply need to stake down to prevent drifting against nominal winds in the 5- to 10-knot range on inshore waters and for this the Micro Anchor is a champ. The next concern I had was durability; I say this because I am rather hard on equipment. When I first looked at a Micro Anchor – all 8 pounds of it – I was a little worried about just how many times it could push an anchor pin in the ground without a problem. I can honestly say I have punished this little unit over the last few years and it’s still ticking perfectly, in saltwater and all. Another pleasant surprise about the Micro Anchor was how easy it was to install – no hydraulic pumps, jack plate drilling or custom mounting plates. 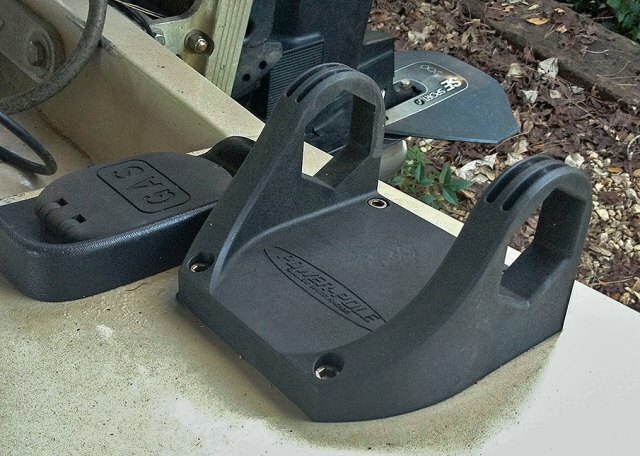 In fact, the unit can be mounted on small jons and flatback canoe transoms with a temporary bracket, similar to a clamp-style transom-mount trolling motor. Since my boat has a closed transom, the clamp-style bracket was out of the question and I had to mount a more permanent screw-in bracket to my transom. I thought this was going to be a problem, but it wasn’t. Since the permanent bracket can be mounted either on the back of the transom (vertically) or up on the “top cap” of the transom (horizontally), I had plenty of options. I chose to mount the bracket on the top cap of the transom, which required drilling four holes through the aluminum cap. The actual bracket is low profile and takes up very little room. The Micro Anchor itself easily attaches to the bracket in under a minute by use of large hand-tightening knobs. This alone is a genius design because I can completely remove the Micro Anchor unit and store it if desired. In terms of powering the Micro-Anchor, a simple power cord runs from a 12-volt marine battery and plugs directly into the Micro Anchor. Now drop a ¾-inch diameter fiberglass spike into the hole and the Micro Anchor takes over from there. On the first use, the Micro Anchor will roll the spike up and down through the unit several times to sort of initialize its roller settings. After that, it’s ready to go. The operation of the Micro-Anchor is simple, fast and efficient. The unit comes with a key-fob style remote control, just like the one that controls an original Power-Pole, which can be worn around the neck or clipped to a belt loop. Double tap the down button, and just like its big brother, the spike automatically lowers down and applies enough force to pin the boat to the bottom. When it’s time to move, double-click up and it reverses course, pulling fiberglass pin up. Now this begs the question: Does that mean the 8-foot stake pin sticks up in the air like a CB antenna when not in use? Yes it does. I usually leave the pin sticking up in the air when fishing, scouting with the trolling motor or idling from spot to spot. If I’m going to plane off and run, I’ll remove the pin from the unit and reinsert it at the next location. To me, that’s a small price to pay for such a huge amount of boat control. I have probably exceeded the limits of what the Micro Anchor was designed to do and yet it has exceeded my expectations. If you have been hesitant about putting a full-size Power-Pole on your small aluminum due to space and weight concerns, consider the Micro Anchor as a feasible alternative. It might be Micro in size but it’s mighty in boat control.